It’s the first Friday of January, and first Friday of 2017!! Isn’t it odd to think a week ago was still last year, and now it’s a new year? As I’ve mentioned before, I’m starting this new year on this blog by participating in the Ultimate Blog Challenge. Today’s writing prompt is the suggestion to write about someone in our life who we admire/d and who has been the most influential. It was easy for me to choose. This post is a spotlight on my late Dad, in memory of his influence and the life lessons he taught. He is the reason I started my other blog, Words of Encouragement, because he had such a gift for it. On September 2, 2002–over 14 years ago–my beloved Dad left his lymphoma-wracked body and entered his eternal reward in Heaven, with the Lord he served his entire life. While his passing left an enormous void in the lives of all of us family members and his many friends, he also left behind an amazing legacy of love, compassion, encouragement, and a truly godly example in the roles of servant of God, husband, father, grandfather, brother, uncle, and friend. My Dad in his final days, with my Mom, my siblings, and me. 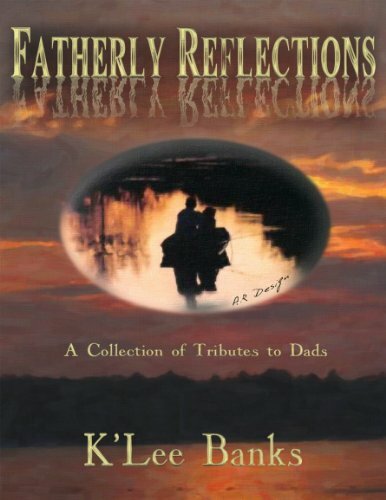 In 2012, I was inspired to write my first book, in his honor and memory, entitled Fatherly Reflections. Here is an excerpt from my book. I apologize in advance, because this makes for a very long post–but I hope you will read it to the end– thanks! How does one fully express the importance of a father’s influence on his family’s life? What place does his masculine presence fill? The condition of society today certainly demonstrates the dire effects of the absence of fathers, or the heart- breaking evidence of abusive fathers. What about those fathers who are kind, decent men, fully committed to their families? Ben was such a man. From the early stages of married life, and as the first of four children arrived, Ben demonstrated that he was wholeheartedly involved in raising and training his children. He also displayed his deep love for his wife, Rena, whom he had met in Germany where both had served in the military in the 1950s. He had served in the Army, while she had served in the Air Force. Ben consistently lavished his wife with tokens of affection — on special occasions and for no reason at all, except that he loved her. On a daily basis, Ben modeled ‘lessons of life’ for his children in numerous ways. Ben was a hard worker, believing that a person must earn his or her paycheck, as his motto was, ‘an honest day’s work for an honest day’s pay.’ At the end of a long day, however, Ben had no problem with putting the work behind him and concentrating on his family. He relished the warmth and comfort of his home, greeting anyone who visited with his renowned ‘bear hugs’ that instantly made people feel welcome. This wonderful man stressed the importance of a deep spiritual relationship with God and faithfully practiced his beliefs, not only in a consistent fashion in his own life, but also as he accompanied his family to church every Sunday. Ben and his family were actively involved in their church, often inviting guests over for dinner, reaching out to those without families, and welcoming out-of-town visiting ministers over for the night. Ben and his wife spent many years creating wonderful memories for their children. Probably one of the best investments he ever made was a pop-up camper, in which the family traveled countless miles all over the country, garnering many years’ worth of camping adventures. Even after the children were out on their own, married, and providing Ben and Rena with grandchildren, nothing could compare to family gatherings ‘back home.’ The years seemed to melt away, as the next generation eventually enjoyed stories and home movies depicting their parents’ and grandparents’ lives in their younger days. Dad with his first grandchild, my son Andrew. Tragically, in the spring of 2001, Ben experienced a mysterious affliction and a debilitating illness. After several diagnoses, a specialist determined that Ben had a form of lymphoma that was particularly aggressive and resistant to treatment. Within several months’ time, Ben had lost a significant amount of weight, taking on the appearance of a gaunt old man even though he was only 68 years old. He eventually lost the ability to walk on his own or stand for long periods of time and needed constant personal care. Ben was blessed to have his wife, who had been a registered nurse for nearly 50 years, as his own personal nurse during his illness. Although Ben’s physical being continued to suffer the vicious attack of his illness, he was a spiritual giant throughout his entire ordeal. He never once blamed God for this illness or any of the pain and ongoing treatments he endured. He continued to welcome guests into his home, even though he could no longer stand to greet them. He daily encouraged his family, relatives, and friends to love and care for each other, and to keep God foremost in their lives. In late August 2002, Ben entered the Veterans Hospital in Manchester, New Hampshire. His family, including many of the grandchildren and other loved ones, surrounded him for several days, under the watchful but compassionate eyes of the hospital’s wonderful healthcare professionals. Ben remained lucid and aware of his surroundings, thanking all those who visited him, expressing gratitude to the healthcare staff for their excellent care, and reminding family and friends alike to not blame God for what had happened, but to instead thank Him for all the time Ben had enjoyed with his family and loved ones. On Labor Day of 2002 (9-2-2002), Ben passed away quietly, following the semi-comatose state he had been in for nearly 48 hours. Fittingly, Rena — his beloved wife and companion of over 45 years — was the one by his side when he passed on. The amazing hospital staff had prepared beds in other rooms near Ben’s room so family members could get some sleep that night after having been up for many hours without sleep. The nurses immediately but gently awoke the family members to let them know it was time to say goodbye. The grief was overwhelming at Ben’s passing, yet an incredible peace filled the room … as if the angels stood by in awe of the love that everyone had for this man. It seemed as if all of those present became enveloped in the heavenly light of Ben’s going home, realizing that he was now pain-free, whole, and embracing his beloved Lord whom Ben had served his entire life, sharing one of those great “bear hugs” for which Ben was well known! At Ben’s memorial service, the church was packed. Even grown men wept unashamedly at the loss of this man, who had been like a brother or a father to them. As people shared their fond memories of Ben, the overwhelming theme was his compassion, his consistent life of faith, his deep love for his wife and family, as well as his great ‘bear hugs’ — a sentiment that elicited the unanimous response that everyone would sorely miss those hugs! One of Ben’s younger granddaughters brought a moment of comic relief by sharing a story from one of many camping trips. She described how her Grampy used to snore so loudly, he would shake the whole camper. Anyone who used to go on those camping trips, even in nearby campsites, laughed and nodded in agreement. Ben was a giant among men and nobody will ever replace him; how can I state this with such conviction? I can express it emphatically because I had known him for 44 years at the time of his passing. You see … Ben was my Dad. If you read all the way through this–thank you and God bless you! Do you have special memories of loved ones who have passed on? Who is the person you most admire and/or who has had the most influence in your life? Do You Know How to Imprint Photos on Fabric? Here's My Method!<< >>Do You Know How to Assemble a Quilt? Here's My Process AND a Contest for a FREE Pillow! My dad passed away four years ago. He also had cancer. I remember him as a very smart man who had the magic touch with numbers. He was like a human calculator. He could look at a long list of digits and add it in his head faster than you could input the numbers into a calculator. Yet, the oddest thing was that he loved calculators. He thought that calculators were fun and he wanted more and more of them. My mom did not share his enthusiasm for calculators. When he brought home yet another calculator, my mom said that he already had perfectly good calculators. So, when we went into a store and he eyed a gleaming new calculator, he said to me, “Shhh, don’t tell your mother!” And I didn’t. He happily enjoyed playing with all of those unnecessary calculators, while adding numbers in his head faster than any of his new toys. Alice Gerard recently posted..Introducing… alice’s photo caption contest! Ooops. Last post. Just told a story about my dad, when you wanted a life lesson that I learned. I think that one of the best life lessons that I’ve learned came from art teachers, who taught me how to draw the human face. They taught me about the shape of the face and where to place the features. They taught me about how to make the eyes look alive and how to shade the face to make it look three dimensional. But, most important of all, they taught me that all human faces are beautiful and that no one is ugly. That was a valuable life lesson for me because I never believed that I was anything but ugly. Learning that no one was ugly made me go back to the mirror and redefine myself as a beautiful human and one of God’s lovely creations. This post is particularly poignant for me as I’ve been thinking of my dad a lot recently. He would have been 100 just after Christmas but he died suddenly when I was 13, at age 53 (viral pneumonia). He and I were really close and we did so much together. He was my hero. This story hits close to home. My father died of cancer in 2008. He was older when diagnosed so all options were not available to him. He tried a few chemo treatments but opted out because of how it made him feel. He and my mother lived in a completely different state so I didn’t see him as much as I wanted. I remember the last time I went down there. He slept alot and we talked a little. I miss him alot when I’m fighting with my kids because I wonder if he would sympathize and side with me, or tell me I’m reaping what I sowed. He was around to see my 1st two kids but not my last 2 to include my 1st boy. I know he would get a kick out of him. I talk to my 2nd two about him but they don’t really get someone they never met and I hate that. I would choose to write about my dad or my uncle (who passed away when I was a young child) for someone I admired. Great post and you can feel the love, admiration and respect. I love when you talk about your dad and his stories. It makes me feel like I get to know him just a little bit. I was just talking to someone the other day about my family. It isn’t so much one life lesson from one person in my life, it is the many life lessons from the people in my life who have helped me grow and be strong and raise my kids. I know, for a fact, that if it wasn’t for my mom and my dad being by my side while I went through the darkest times of my life I wouldn’t be here and I wouldn’t be the person that I am. My family wrapped themselves around me and allowed me to grieve and grow without judgement for “taking so long to just get over it” and still, almost 30 years later, they understand when I have a bad day from my past. I really couldn’t have done it without my family. My mom and my dad taught us kids that the only people we can count us is our family!! and we may fight but we are just as strong and close knit as ever. What a wonderful tribute to your dad — he sounds like an amazing man and the fact that you wrote a book means you will keep his memory alive for generations after you. I miss my parents, too. I just got a decade old photo album out yesterday to reminisce with one of my boys.